My mission is to make your heart smile. And to vanquish the cares of the world by focusing on its delights. A daunting task perhaps. But, as the Ninja Baker I choose to accept my mission to sweeten your day with a blog, featuring Asian fusion and traditional American treat recipes - including musings on recipes of a happy life. And Japan travel tips! I also hope to add more video interviews with restaurateurs as well as homemakers from around the globe. The purpose of Ninja Baking is to provide a cultural bridge between the East and West. Especially between Japan and America. Although I’m an American of European descent, I lived in Japan for the first seventeen years of my life and only spoke Japanese until age five. From my bilingual businessman father and my international tennis star mother, I gained an appreciation for a multicultural perspective. So, even though I love the history and food of my American heritage, I have also adopted the culture of Japan into my life. As I go about stalking the sweet stuff of life, this Ninja Baker’s aim is to serve as an ambassador: illuminating and celebrating the commonalities and promoting greater appreciation for the differences among countries. Japanese was the Ninja Baker’s first language. Her tennis star mother (Dorothy Knode was number five in the world and played Wimbledon twelve times) and her Merrill Lynch VP father were often on the road. So, much time was spent at her nanny, Kawaji-san’s side. Lessons in appreciation of simple beauty and simplicity were garnered at an early age. Such as the dramatic ruby ume plum pickle studding snow-white sticky rice. And a steaming sweet bun spilling red bean curd. The biggest lesson was the care given to every ingredient and flavor, which resulted in delicious daily fare. Later, during summer vacations in Colorado, as sous chef to grandmother, Nona, the same importance of pouring love into American standards was introduced. 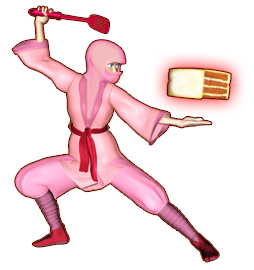 As a grown up, the Ninja Baker has studied the art of baking. Including workshops with Cordon Bleu professors. But experience has proven that Nona and Kawaji-san’s admonition to always add love is the secret ingredient to successful baking. And a happy life! Whether the dessert is inspired by the East, the West or somewhere in between. From a home hobby and passion for baking, the Ninja Baker blog was born. The reception to my writing and recipes was well received. Subsequently, purchase requests for birthday and holiday cupcakes started popping up at NinjaBakerBlog@gmail.com . My cupcakes have brought smiles to FOX TV crews, family and friends. This Ninja Baker (who has trained with Cordon Bleu professors) hopes to bring a little sunshine and culture to your day, too.